The sentence often pops up between industry people discussing a new product or one under development. “It’s an odor, not a perfume” basically means that there is no bridge between the scent and the skin. This was, for instance, the criterion for setting apart Frédéric Malle’s alcoholic perfumes from his line of home fragrances, several of which are very realistic soliflores based on headspace captures. As there was no need to tweak the structure of the “natural” fragrance of gardenia, lily or lily-of-the-valley in order to stress (or incorporate) the elements that would weld the composition to the skin, the perfumers were able to achieve much more vivid naturalistic effects. To compose an original, successful soliflore for alcoholic perfumery would have required a considerable amount of extra work in order to give off the same natural effect without resorting to traditional “perfume-y” notes. “It’s an odor, not a perfume” can also mean that a composition ventures so far outside the usual codes of perfumery that it does not actually register as perfume. I’ve heard it said of Cartier’s La Treizième Heure and of Serge Lutens’s Filles en Aiguilles, for instance, though both products are attractive to many people and thus do get some wear. More recently, it’s been said about that utterly strange mineral/animal hybrid, Byredo’s M/M Ink . Nevertheless, there are some materials and accords that are more skin-loving than others, and not only the obviously animalic ones. White flowers are usually thought to echo human smells through indoles, and this is accurate, but the trick to me lies in the fruity-milky-oily effects of their lactones, which are actually reminiscent of unwashed hair and skin. Peach lactone (aldehyde C14) and coconut lactone (aldehyde C18) also work a charm. As does anything that’s a bit fatty-oily, as a matter of fact: the waxy facets of aliphatic aldehydes, the buttery facets of orris butter (myristic acid, which it shares with carrot seed oil, coconut oil and nutmeg oil). Or costus, which smells of dirty hair and mutton (a reconstitution is now used since it is banned). In fact, there is a whole cornucopia of materials – though thanks to IFRA, their number is decreasing yearly – that can wed perfume to our flesh. It’s all a matter of how to use them, and then, of how we ourselves perceive them when they become part of our skin – other notes may disrupt those effects, make them feel foreign to us, or too far off from what perfume is meant to smell like. Again, a matter of personal settings. The woman who gave us the template for what perfume is meant to smell like, the savvy Gabrielle Chanel, probably got it right when she famously said -- though the quote is quite probably apocryphal, but who care? -- “A woman is meant to smell like a woman, not like a rose.” Unless you tweak that rose to make it grow out of our skin. On to you now: what distinguishes an odor from a perfume for you? And what are your most efficient skin-loving notes? Hmm... I guess to me it's a question of complexity or 'dimensionality', if such a word exists. I would take an odour to mean something fairly mono-faceted, whereas a perfume has got to present several different aspects before it can be called a perfume. I get what you're saying about the bridge between the juice and skin, but then where does that leave those 'perfumes' which smell better on paper or fabric rather than on skin... or do we just write them off as anomalies caused by personal variations in body chemistry? My most efficient skin-loving notes? Sandalwood, I guess... and patchouli and vetivert. Oh, and cedar! All the usual suspects. Can't wait to read what everyone else writes. Persolaise, when industry people are talking about "bridges" they're not really taking into account personal skin quirks I think. That said, Edmond Roudnitska was adamantly against spraying perfume on skin, and he recommended perfuming one's clothing. Odours seem to be a lesser being, if one can express oneself in such terms. They can be of course of a lovely character, but they are not the whole, which would be a fragrance. In general language, before entering the parfumista world, odour is a neuter tending to negative whereas fragrance has a positive connotation. One says the fragrance of lilacs, the odour of decay. Those conventionalities in language may not be relevant to perfume, but language is telling. Odour is just that. To achieve the status of fragrance, the higher instance, I suppose a more complex structure is due. The 'odour' of roses is the fearful effect of air fresheners sprayed in a room. The fragrance of roses, even for those who do not like them, is a sumptuous syllabus. When it comes to the skin there's a veil of sweetness and acidity, a mixture of yeast and hay and fruits that somehow comes to mind. What are the woods, roots,spices and absolutes that create that effect? Why do smoke and incense give a sense of intimacy: have we all been to the crossing between heaven and hell? As for smoke, I wonder whether it's not literally something we know in our genes: after all, fire is what made us human. Incense is somewhat less archaic, one of the oldest perfumes of mankind and yet still a living experience for many of us, in innumerable cultures. French doesn't call perfume composition fragrances: it's just "parfum", though "parfum" can apply both to man-made compositions and pleasant natural ones. "Fragrance" is a little-used, literary word, and means "pleasant smell". and odours can be a perfume. "Watching the new Harry Potter, a unpleasant odor signaled the teenage presence"
Right now my skin is loving the heavenly Homage. Great topic! Before reading your post, I would have said the difference was primarily one of complexity and, more important, artistry. But there are very complex food and place odors that are very appealing but nonetheless would not be attractive as perfume. I enjoy Ineke's Field Notes from Paris and imagine it smells like a cafe, but it could only be a very particular kind of cafe moment - one with enough sweet scents - and adapted to smell good on the skin - replete with skin-loving notes such as tobacco, patchouli, coffee, bread, liquor. I wish I knew more about notes and could distinguish them better so I could think about your question more deeply. All I can say is that this must be one of the reasons that perfumes with some natural ingredients smell better than cheaper scents that lack them. And this must be why musk and leather scents are so appealing - they are so linked to skin. Which reminds me how sad I am that L'AP is discontinuing Dzing! (Not depressed, because I do have the large bottle, fortunately :-) I always think Dzing! smells like the skin of the woman riding on the back of the tiger on the label - simply the best skin scent - how can they not pass it on to future generations! For me, too, a "perfume" needs to have some idea of composition, of complexity. When I say something is an "odor," I mean it's a nearly literal representation of a thing or a smell, not an interpretation of it. An "odor" has no pretensions of development or change - spray it on and it smells like grapefruit & basil (or whatever) when it hits your skin and it still smells like grapefruit & basil three hours later. Like laundry detergent or furniture polish, it's this and this only. My skin seems to love amber and all other resinous, woody things. And the big indolic white flowers, too. Or maybe it's just that my nose loves them and that's what makes me think my skin loves them. I've often wondered about this little chicken/egg dilemma. Everything is scented yet nothing has a smell any longer. Today, odorise and deodorise have the same meaning. An arsenal for the carnival of the fifth sense. Candles, sprays, pot-pourris, disseminators, deodorants...all create their falsehoods, cigars masked by jasmine and onion camouflaged under lavender...how many of these mutant couples invade our every day life. Yet an open window remains an ideal solution, just as a bath remains a ritual before wearing perfume. Whatever its quality, deodorant is a perfume which won't confess its name. If one refuses perfume, it can be bought under another name. Marketing? There is a great marketing which is built around creation, generous progressive. It prepares the future intelligently and masters it. Claiming to hold the same function, others build a new universe of mediocrity around their own fears which they name consumers. Absence of smell seems to have become a king of angst which, according to the individual, can be transformed into the very idea of a 'bad smell'. Our time flees from the slightest possibility of finding reality through smell, it fears it, avoids its memory. A taste for perfume can only exist through awareness of places, matters, beings...If this is not the case, perfume can disappear. It harms the senses more than it activates them. I read all comments: is it possible that for those who are not chemically aware there's a very thin line dividing the two categories, to the point that any clear cut division is deemed arbitrary? I think of some Dyptique candles and sprays, are they just odours? If the quality of the scent is questioned, they are more than odour, yet they are not 'fragrance'. There's a threshold, our skin, and everything changes there. So the division is far from arbitrary. A hard question, Denyse, harder than one suspects at first. 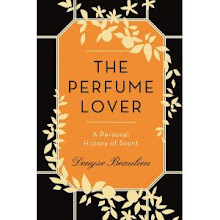 March, the great Jean Carles, who conceived a method for training perfumers that is still taught, wrote that the best way to study a perfume was to spray it in a room, step out and come back, much better than blotters or skin. There are some perfumes that are hard to appreciate on skin because what we sniff on the wrist is not at all the sillage others get... So that spraying them in the room would be another way of appreciating their complexity. trhoades, in common language "odour" is "bad smell", which is... that teenage waft you refer to. In the perfume industry, it seems to refer not to a bad smell but to something that can be a complex, beautiful composition yet is not suitable to be sold as perfume-to-wear. Anonymous, it's a difficult cursor to set -- on the French side, a reader pointed out that maybe it had to do with overly realistic renditions (food, the smells of places) versus more stylised approaches. Even something that's traditionally "perfume-y", like a soliflore, can come off to me as an "odeur": it needs something else, though it may be very complex. StyleSpy, I just made the "too figurative" versus more stylised argument above, but you're right: some scents are just, well, simple little things that we would call "sent-bon" in French. They do seem to have a public though: I can't count the number of women I know, usually quite educated, who seem to favour Jo Malone and her simple little sent-bons. As I said in the post, it's not just the indoles in white flowers that love our skin, it's the lactones -- creamy fruity hay... Our scalp, for instance, produces them naturally. It's an interesting anthropological question, isn't it? I had my hair scented with Cambodian oud smoke at a party last week (yum! ), and my Arab hosts explained that the smell of oud is an important cultural marker, but that they wear (mostly French) perfumes as well. It seems that most of the world these days thinks of "proper perfumes" as French-derived, though, ironically, the French are changing perfumes dramatically, blurring functional products with perfumes, and so on. "Bas de Soie" kind of played with that idea, I think. So this question of what is a perfume is really big enough for a dissertation or a book! Uella, it always reads better in the original version, but of course Mr. Lutens is right: the real smell of things is masked by a million different artificial scents. That said, I'd rather smell the muguet room spray in the office loo than what someone else left there as an olfactory memento. EEM, in the "parfums d'ambiance" category, compositions are becoming increasingly sophisticated - the Frédéric Malle line and Trudon candles being a proof in point. So, no, the criterion is not sophistication. Or beauty. I think even perfumers don't necessarily know exactly: I mean they know what *works*, but the point at which it works is hard to set when they're trying to stray from traditional forms. Marla, you raise an interesting point which brings to mind my recent experience with my students at the London College of Fashion. I had two Indian students and a Japanese student: all three had interesting and rich olfactory "librairies" in their memories. But when they gave in their assignments (the students had to write a perfume brief), they picked very conventional notes, things that corresponded with what perfume "should" be rather than with their experience and memories. There is indeed material for a whole essay... and more. So Roudnitska said spray on fabric and Carles said spray in a room... could we conclude that perhaps we place too much emphasis on the way a perfume functions on skin?? It is fascinating...we could conclude what you suggest, Persolaise, but we could also conclude that the vector of seduction impulses has reverted, and that humans at present prefer to satisfy their own demand for pleasure before they turn to please an imaginary other. When you spray rooms and clothes you think of others, when you dab or spray your skin you think about you and a chosen few. Perhaps. Persolaise, for Carles it was only as an evaluation method, as opposed to the blotter. EEM, one thing is for sure, perfuming the skin (other than with cosmetics) is not a universal practice, and it's not that old... Even in the 19th century it was deemed preferable to perfume handkerchiefs or sachets. 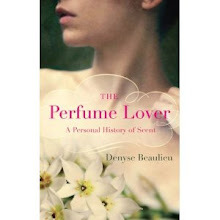 Perhaps the idea of perfume + skin = personality or persona, is rather new as well. Sort of like a second skin. It certainly seems that parfum/odeur dichotomy is one that is dividing perfume makers into two different schools- those that evolk a place, moment or even a facet of an ingredient rather than those that create often more abstract scents that aim beyond the basic materials themselves. I don't think this is a question of simple vs. complex however, more a conscious philosophy of composition and artistry. Where do you think someone like JCE fits? Marla, obviously, it's people like Coty and Roudnitska who wrote the book to start with! But I wouldn't go the vintage dress way: I almost always mismatch periods with clothing and perfume, otherwise you end up with a costume. Alexander, you're right, there is a matter of option here rather than complexity. But you can perfectly explore a facet of a material and end up with a perfume that fits within the "parfum" definition (Havana Vanille, Osmanthe Yunnan...). The L'Artisan "place" perfumes (Dzing, Timbuktu, Bois Farine) work well too. But when I think of too vividly figurative products like those of Christopher Brosius, for instance, I think "odeur". Well, you know, I like naturals as much as the next girl, and I'm not totally civet-phobic, but... there *are* limits to olfactory curiosity. I've read all comments. Is it possible for all (including the "chemically aware" and "chemically naive" alike) to simply be wallowing in a fit of grandiose verbiage and semantics? If it's a game of connotation we're playing, "fragrance" implies pleasurable and "odor" indicates a neutral or distasteful scent. So, yes, there is a fine line and it is language -- not the site of application. To hint at various "true" scents (think of I Hate Perfume) being less than fragrance reveals bias and a sad lack of life experience paralleling those comforts. A fragrance inspires a feeling or a memory. If Black March summons up a teenage excursion into the muddy woods surrounding my high school sweetheart's house and yields me "chemically unaware" to deem that "fragrance"... I'll hang out down here with the other plebs. Anonymous, Christopher Brosius' work is fascinating and it displaces the definition of perfume: what can be the "subject" of it, how it is used... After all, he was the one who called his company "I hate perfume", so he's clearly out to break new ground, and he does. In this case, you're right, site of application doesn't matter: you could put Black March on a handkerchief and sniff at it all day, rather than wear it on skin, and it wouldn't change its evocative effect. *What* it evokes is another matter: to my Chinese students, Black March smells of kale. And once you hear "kale", it's hard not so smell it. So, yes, it *is* a matter of language. It always is. Fascinating topic as usual. For me, 'skin-friendliness' is an important factor in how I chose and evaluate perfumes - there are notes and perfumes I find stunning, but that I don't wear because they feel too disembodied. Most incenses and lov scents fit in this category for me, as do the majority of JCE's Hermessences. This 'disembodied' effect also makes me think of what some people refer to as the 'space' between molecules/notes: not sure what the actual chemical reality of that is, but I find scents perceived as 'dense' or 'rich' do better on skin, even when they're incensey etc. (perhaps it's merely that the more ingredients a perfume contians, the more likely it is to exhibit a note that is 'human-friendly'). Another vague and no doubt unfounded theory I have is that scents copied from living organisms (plants/animals) will inevitably share more facets with human scents than dead/inorganic ones. Any truth in that do you think? 2/ The more "concise" formulas vs. the richer ones... it's an interesting point to consider, but a little "throw enough mud on the wall and some will stick"... But for sure, if you add musk, lactones, ambers, you're going to get something that segues with skin. And most modern perfumes have all of those things. 3/ The vegetal/animal themes: I don't know of many perfumes that would be, say, mineral or so synthetic *nothing* in them echoes a vegetal or animal smell... But you're right that our bodies share many odorant molecules with the vegetal and animal kingdoms. Lactones, musks, aldehydes: it's all there on our skins. There are many "smelly" molecules out there, and they're distributed all over, including in us. Well, as sometimes happens with your more philosophical essays, I can't stop thinking of the central questions..."Oi've gotta thought...formin' in me 'ed!" Marla, I'm supposing you mean that those signals are sent on a kind of subconscious, jungle/savannah level... Otherwise a lot of people could answer: I wear perfume for myself. Could be that the *impulse* to scent oneself is what's instinctive, rather than the notes themselves? As for the chosen notes, they'd be a cross between social convention (white musk = clean), personal experience (driven partly by social convention since that would be what we were in contact with, at least for some of the notes), and maybe some deap-seated archetypes? Not sure that it's related to the odor/perfume distinction but on the French side, someone was saying that perfume would be something like your manifesto, whereas an odor would be something that doesn't need you to exist. I like what was said on the French side, I think that's true, and odors can certainly be harnessed to become communicative materials; but at what point do the odors become perfumes(if worn on the body)? Marla, I guess that when perfumers attempt to go beyond the old "tried and true" bases to invent new forms, there's no single answer: you see what works and what doesn't. What's a quirky, original or interesting smell that doesn't need you to exist because it is a whole story in and of itself, and what is partly... human? Animal? I think that's why all the great classics had animal notes, or white flowers: they prolonged our animality under the sublime beauty. Yes, you see what works or what doesn't for a particular situation. And I think you've nailed it on the white florals/animalics (certainly explains why the vintages still sell)! Marla, it also explains why they're stanky to a lot of people... it's a whiff of the beast within. Yeah, girl, you got it! I would say that perfume is absolutely a form of communication. How does the line go: "Every morning when I decide what I'm going to wear, what I'm actually deciding is who I'm going to be." I'm sure I haven't got the quotation exactly right - and it did originally refer to clothing - but you get the idea. Having said that, I'm sure an odour communicates too... but maybe it doesn't communicate as much... which perhaps brings us back to complexity. I'm also inclined to side with the Anonymous comment that a lot of this comes down to semantics. Denyse, regarding Dzing!, I read this on The Non-Blonde blog, a Friday, November 19 post on discontinued perfumes. Checking back, it is not clear from the post if Gaia had new information or was still going on what the Guide said. I guess I tend to accept this at face value because Luckyscent, for example, has not had the 50-ml bottles for the last year, at least. My hypothesis is that if Dzing! had been discontinued, the 50-ml bottles would sell out first, so this is a sign of impending doom. I hope I'm wrong (and apologize for spreading misinformation if that is the case) - it is such a great scent! For the notes... Well you might not pick them out by themselves, but you'd be aware of the way they act in the blend, as an adjective (creamy, peachy, coconutty, fatty, etc. ), wouldn't you? oh...but the unconscious worn on the skin is clearly a form of communication. people kiss each other socially, they stand close to each other in lifts and in airplane isles...they do tell stories - more or less aware of that - about their idea of beauty, their perception of who they are, their budget, their social class, their sexuality. All that is given and taken, breathed in and out, constantly. Odours and fragrance - both are means of communication. EEM, of course they're messages, but how much of the message comes from our representation of the brand we bought, the projection onto the name of the perfume, and how much from the actual notes? Your blog is my favourite! Congratulations!!! you write very well and it's always very interesting. About me the best scent on the skin is always tuberouse. Grazie, Giovanni... I'm quite the tuberose lover as well. Certainly the way you described skin-friendliness in your post made sense to me, and you are right, one could think of it in terms of creamy, peachy, coconutty, fatty, etc. Of course, I don't usually think of scent that way, just as I don't think of art that way. I wonder if I could answer this question in terms of art, for which I do have all the words, i.e., what separates fabric designs from paintings? Usually designs are simpler and repetitive. I have a museum shirt from Vienna with a reproduction of a painting on it. It is beautiful, but I don't wear it often because it is so arresting/distracting. I guess aromas and ambient fragrances need to be less distracting, too. Sorry, forgot to sign off the museum shirt comment as nozknoz! Nozknoz, I see what you mean about "art on a shirt" versus a design pattern... But I wouldn't imagine a perfume, however complex and beautiful it is, could be too distracting either. Mind you, we're not permanently aware of the perfume we wear or we'd go nuts (which is why a scrubber can make us want to flay ourselves). As for the "skin-friendly" notes, I'm wondering whether they enter the equation in artistic terms, or just because of the mode of conveyance of the scent, the human body. Probably artistic in the sense that you have to factor those notes in your formula, they're part of the harmony. But you could perfectly imagine an olfactory piece that wouldn't be conceived for the skin. just saw the thread on Dzing! we bought it last Saturday at an Artisan Parfumeur shop in Paris. the sale assistant did not mention anything but then she was so uninterested in what she sells (she did not even know who had created Dzing!) that she may not have known herself. there are probably nicer AP shops in Paris, i don't recommend the one next to the Louvre. with the other SAs. I've heard complaints about the London staff. I hope they'll address the issue.